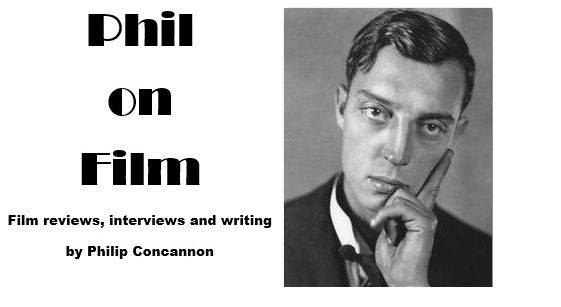 Paul Safranek is a very typical Alexander Payne protagonist. As personified by Matt Damon in Downsizing, Paul is a doughy, middle-aged guy from Omaha who feels that his life has somehow stalled. When we first meet him he is visiting his sick mother, and when we catch up with him ten years later we discover that he is still living in his late mother's house, now with his wife Audrey (Kristen Wiig). They both yearn to trade up for a bigger home, but their combined incomes from doing jobs they find repetitive and unfulfilling won't allow them to do so. Paul once had dreams of being a surgeon and a meeting with a former classmate who made it as a successful anaesthetist stings his pride. Maybe there is a way for Paul and Audrey to transform their fortunes? Paul may be a typical Alexander Payne protagonist, but fortunately for him, he is not in a typical Alexander Payne film. The title Downsizing refers to a scientific process dreamed up by Norwegian boffins that will shrink people to roughly five inches in height and – in theory – ease the problems caused by overpopulation and our rapacious use of the earth's resources. That's the PR-friendly pitch, anyway. The attraction for ordinary Americans like Paul and Audrey is much more basic. “You mean all that crap about saving the planet?” Paul's shrunken friend Dave (Jason Sudeikis) scoffs. “Downsizing is about saving yourself.” When Paul and Audrey attend a glitzy sales seminar, they are told that that the $150,000 they currently have to their name will translate into $12.5 million in the tiny town of Leisureland. Neil Patrick Harris seduces them with the promise of an opulent mansion and Laura Dern cameos to show off the diamonds she bought for a song. This is the life, and nobody has much to say about saving the world. There are many things a filmmaker could do with Downsizing's high-concept premise. Payne's choices are, to say the least, unexpected, and they will undoubtedly be unsatisfying for those expecting a lot more comic mileage from the contrast between little people and large objects. Instead, when Paul eventually ends up living alone in Leisureland, he finds that his life hasn't changed that much at all; he feels just as stuck and just as lacking in purpose in this world as he did outside. It might feel that Payne has inexplicably abandoned the sci-fi uniqueness of his film's opening third in order to focus on the mundane middle-aged concerns that have been the focus for much of his cinema, but that is part of the film's gag. Given the opportunity to build a whole new society, these microscopic Americans revert to type, living a life of abundant material wealth and thoughtless waste, with neither a thought nor a care for whoever will be cleaning up their mess. 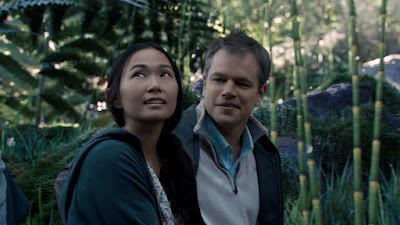 A brief but telling shot in Downsizing occurs early in the film when a still-unconscious Paul has just gone through the shrinking procedure and is collected on the other side of the Leisureland divide by a group of orderlies, most of whom are black. When a team of cleaners turn up at the apartment owned by the hard-partying racketeer Dusan Mirkovic (Christoph Waltz, enjoyably smug), we notice that they are all Asian women or Latinas. It seems the social hierarchies and racial divides of the big world have been imposed on the little one too, and when Paul befriends one of the cleaners, a one-legged Vietnamese refugee named Ngoc Lan (Hong Chau), he gets to see how the other half live – in a tiny slum on the outskirts of Leisureland, invisible to its mostly white citizens. Being largely selfish, passive and clueless, Paul is not a great central character for a movie, so it's a relief when Ngoc Lan hobbles into view and finally gives us someone worth rooting for. Ngoc Lan was smuggled into the US in a TV box (consumer goods having replaced trucks as a potential route for tiny refugees) and she was the only survivor of that ordeal, although her left leg didn't survive with her. A devout Christian, she never bemoans her lot or dwells on the hardships of her past. She simply works tirelessly and spends the rest of her time caring for the sick and poor in the slum. “When you know death come soon, you look around things more close,” she tells Paul in her broken English, and her clear-eyed perspective on life and death helps open Paul's eyes to an existence beyond his own. There are a lot of fascinating ideas in play here and, in truth, I'm not sure Payne really knows how to strike the right balance or follow through on most of them. When Paul embarks on a third act voyage with Ngoc Lan, Dusan and Dusan's seafaring buddy Konrad (a hilariously deadpan Udo Kier), the film begins to feel particularly unwieldy, introducing a potentially cataclysmic plot twist that doesn't have time to settle. But I was happy to stick with Downsizing all the way to the end of its odd journey, which came as something of a surprise given how much I disliked Alexander Payne's last two features Nebraska and The Descendants. Both of those movies felt inert, bitter and condescending, whereas Downsizing feels like something genuinely and refreshingly new. It's a film that looks outwards and reaches for something beyond the territory Payne normally operates in, possessing a strain of optimism and – thanks to Chau's remarkable performance – empathy that I found very moving. Downsizing is far from a perfect film, but it's a thoughtful and ambitious one, and it deserves more than the dismissive response it has received thus far. Perhaps it's easy to see why a film like this has flopped in the current moviegoing climate, but I hope Alexander Payne isn't discouraged from continuing to think big.